"Crenis" redirects here. For another genus of brush-footed butterfly with the same (invalid) name, see Sevenia. About 39, see species list in text. Heliconius comprises a colorful and widespread genus of brush-footed butterfly commonly known as the longwings or heliconians. This genus is distributed throughout the tropical and subtropical regions of the New World, from South America as far north as the southern United States. The larvae of these butterflies eat Passion flower vines (Passifloraceae). Adults exhibit bright wing color patterns to signal their distastefulness to potential predators. Brought to the forefront of scientific attention by Victorian naturalists, these butterflies exhibit a striking diversity and mimicry, both amongst themselves and with species in other groups of butterflies and moths. The study of Heliconius and other groups of mimetic butterflies allowed the English naturalist Henry Walter Bates, following his return from Brazil in 1859, to lend support to Charles Darwin, who had found similar diversity amongst the Galapagos Finches. Heliconius butterflies have been a subject of many studies, due partly to their abundance and the relative ease of breeding them under laboratory conditions, but also because of the extensive mimicry that occurs in this group. From the nineteenth century to the present-day, their study has helped scientists to understand how new species are formed and why nature is so diverse. In particular, the genus is suitable for the study of both Batesian mimicry and Müllerian mimicry. Because of the type of plant material that Heliconius caterpillars favor and the resulting poisons they store in their tissues, the adult butterflies are usually unpalatable to predators. This warning is announced, to the mutual benefit of both parties, by bright colors and contrasting wing patterns, a phenomenon known as aposematism. Heliconius butterflies are thus Müllerian mimics of one another, and are also involved in Müllerian mimicry with various species of Ithomiini, Danaini, Riodinidae (Ithomeis and Stalachtis) and Acraeini as well as pericopine arctiid moths. They are probably the models for various palatable Batesian mimics, including Papilio zagreus and various Phyciodina. 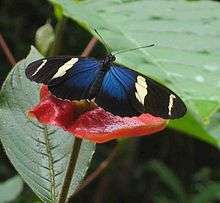 Heliconius butterflies such as Heliconius numata benefit from mimicking other unpalatable species of butterfly in their local habitat, such as Melinaea, because doing so spreads the cost of educating predators. Such mimicry is termed Müllerian and may result in convergent evolution. Work has been done to try to understand the genetic changes responsible for the convergent evolution of wing patterns in comimetic species. Molecular work on two distantly related Heliconius comimics, Heliconius melpomene and Heliconius erato, has revealed that homologous genomic regions in the species are responsible for the convergence in wing patterns. Also, Supple had found evidence of two co-mimics H. erato and H. melpomene having no shared single nucleotide polymorphisms (SNPs), which would be indicative of introgression, and hypothesized the same regulatory genes for color/pattern had comparably changed in response to the same selective forces. Similarly, molecular evidence indicates that Heliconius numata shares the same patterning homologues, but that these loci are locked into a wing patterning supergene that results in a lack of recombination and a finite set of wing pattern morphs. One puzzling thought with Müllerian mimicry/convergence is it would be predicted the butterflies would all eventually converge on the same color and pattern for the highest predator education. Instead Heliconius butterflies are greatly diverse, and even form multiple ‘mimicry rings’ within the same geographical area. Additional evolutionary forces are likely at work. 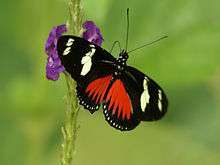 Heliconius butterflies are models for the study of speciation. 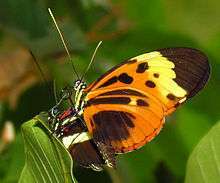 Hybrid speciation has been hypothesized to occur in this genus and may contribute to the diverse mimicry found in Heliconius butterflies. It has been proposed that two closely related species, H. cydno and H. melpomene, hybridized to create the species H. heurippa. And in a DNA sequencing comparison involving species H. m. aglope, H. timareta, and H. m. amaryllis, it was found that gene sequences around mimicry loci were more recently diverged in comparison with the rest of the genome, providing evidence for speciation by hybridization over speciation by ancestral polymorphism. Hybridization is correlated with introgression. Results from Supple and her team have revealed showed SNP’s being polymorphic mostly around hybrid zones of a genome, and they claimed this supported the mechanism of introgression over ancestral variation for genetic material exchange for certain species. Selection factors can drive introgression to revolve around genes correlated with wing pattern and color. Research has shown introgression centering on two known chromosomes that contain mimicry alleles. Assortive mating reproductively isolates H. heurippa from its parental species. Melo did a study on the hybrid H. heurippa to see its mating habits in regards to preference between other hybrids and its parental species. The results showed H. heurippa chose to reproduce via backcrossing, while the parental species were highly unlikely to reproduce with the backcrosses. This is significant, because hybrids’ mating behavior would relatively quickly isolate itself from its parental species, and eventually form a species itself, as defined by lack of gene flow. His team also hypothesized that along with a mixed inheritance of color and pattern, the hybrids also obtained a mixed preference for mates from their parental species genes. The H. heurippa likely had a genetic attraction for other hybrids, leading to its reproductive isolation and speciation. Although rare, Heliconius butterflies are an example of homoploid hybrid speciation, i.e. hybridization without changing the number of chromosomes. Aposematism, using warning colors, has also been noted to help improve species diversification which may also attribute to the wide range of Heliconius butterflies. Heliconius has evolved two forms of mating. The main form is general sexual reproduction. Some species of Heliconius however, have converged evolutionarily in regards to pupal mating. One such species to exhibit this behavior is Heliconius charithonia. In this form of mating, the male Heliconius finds a female pupae and waits until a day before she is moulted before he mates. With this type of mating there is no sexual selection present. Heliconius female butterflies also disperse their eggs much slower than other species of butterflies. They obtain their nutrients for egg production through pollen in the adult stage rather than the larval stage. Due to nutrient collection in the adult rather than larval stage, adult females have an extensively longer life compared to others species which allows them to better disperse their eggs for survival and speciation. This form of egg production is helpful because larva are much more vulnerable than adult stages, although they also utilize aposematism. Because many of the nutrients needed to produce eggs are obtained in the adult stage the larval stage is much shorter and less susceptible to predation. In order to be unpalatable, the Heliconius butterflies use cyanic characteristics, meaning they produce substances that have a cyanide group attached to them, ultimately making them harmful. Research has found that the amino acids needed to make the cyanic compounds come from feeding on pollen. Although feeding on pollen takes longer than nectar feeding, the aposematic characteristics help to warn predators away and give them more time for feeding. While the Heliconius larvae feed on the Passifloraceae plant, which also has cyanic characteristics, the larvae have evolved the ability to neutralize the cyanic molecules to protect them from the negative effects of the plant. Most current researchers agree that there are some 39 Heliconius species. These are listed alphabetically here, according to Gerardo Lamas' (2004) checklist. Note that the subspecific nomenclature is incomplete for many species (there are over 2000 published names associated with the genus, many of which are subjective synonyms or infrasubspecific names). 1 2 Wade, Nicholas (15 August 2011). "A Supergene Paints Wings for Surviving Biological War". NY Times. Retrieved 17 August 2011. ↑ Counterman, B A, Araujo-Perez, F, Hines, H M, Baxter, S W, Morrison, C M, Lindstrom, D P and Papa, R, 2010. Genomic hotspots for adaptation: The population genetics of Müllerian mimicry in heliconius erato. Plos Genetics 6:-. ↑ Supple, M., Hines, H., Dasmahapatra, K., Lewis J., Nielsen D., Lavoie, C., Ray, D., Salavar, C., Mcmillan, O., Counterman, B. 2103. Genomic architecture of adaptive color pattern divergence and convergence in Heliconius butterflies. Genome research (2013): gr-150615. ↑ Mallet, J., Gilbert, L. 1994. Why are there so many mimicry rings? Correlations between habitats, behaviour, and mimicry in Heliconius butterlies. 1994. Biological Journal of the Linnean Society (1995), 55: 159-180. ↑ Brower A V Z (2011). "Hybrid speciation in Heliconius butterflies? A review and critique of the evidence". Genetica. 139 (2): 589–609. doi:10.1007/s10709-010-9530-4. ↑ Joel Smith and Marcus R. Kronforst. “Do Heliconius Butterflies species exchange mimicry alleles?” Bio. Lett. 2013 9, 20130503, published 17 July 2013. ↑ Nadeau, N., Martin, S., Kozak, K., Salazar, C., Dasmahapatra, K., Davey, J., Baxter, S., Blaxter, M., Mallet, J., Jiggins C. 2012. Genome-wide patterns of divergence and gene flow across a butterfly radiation. Molecular Ecology (2013) 22, 814-826. ↑ The Heliconius Genome Consortium. 2012. Butterfly genome reveals promiscuous exchange of mimicry adaptations among species. Nature (2012) vol. 487. ↑ Mavarez, J, Salazar, C A, Bermingham, E, Salcedo, C, Jiggins, C D and Linares, M, 2006. Speciation by hybridization in heliconius butterflies. Nature 441:868–71. ↑ Melo, M., Salazar, C., Jiggins, C., and Linares, M. 2008. Assortative mating preferences among hybrids offer a route to hybrid speciation. Evolution 63.6 (2009: 1660-1665). ↑ Prezeczek K, C. Mueller, and S.M. Vamosi. 2008. The evolution of the aposematism is accompanied by increased diversification. Integrative Zoology. 3:149-156. ↑ Llaurens V, M Joron, and M. Thery. 2014. Cryptic differences in colour among Mullerian mimics: how can the visual capacities of predators and prey shape the evolution of wingcolours?. J. Evol. Biol. 27:531-540. ↑ Vane-Wright R.I, P.R. Ackery eds. 1984. The Biology of Butterflies. Symposium of the Royal Entomological Society of London. Number 11. Academic Press, London, U.K.
↑ Sourakov, Andrei. (2008). Pupal Mating in Zebra Longwing (Heliconius Charithonia): Photographic Evidence. News of the Lepidopterists' Society 50(1):26-32. ↑ Nahrstedt A, R.H. Davis. 1980. The occurrence of the cyanoglucosides linamarin and lotaustralin, in Acraea and Heliconius butterflies. Comp. Biochem. Physiol.68B:575-577. ↑ Price P.W., T.M. Lewinsohn, G.W. Fernandes, W.W. Benson eds. 1991. Plant- Animal Interactions: Evolutionary Ecology in Tropical and Temperate Regions. John Wiley and Sons, Inc, New. York, United States. ↑ Lamas, G (Ed), 2004. Atlas of Neotropical Lepidoptera. Checklist: Part 4A Hesperioidea – Papiionoidea. Gainesville, Scientific Publishers/Association of Tropical Lepidoptera. Kapan, D D, 2001. Three-butterfly system provides a field test of Müllerian mimicry. Nature, 409, 338–40. Kronforst, M R, Young, L G, Blume, L M and Gilbert, L E, 2006. Multilocus analyses of admixture and introgression among hybridizing Heliconius butterflies. Evolution, 60, 1254–68. Wikimedia Commons has media related to Heliconius.